The date is January 19, 2010. The senatorial race for Massachusetts has been won by a Republican, Scott Brown. The looser was the Democratic Attorney General, Martha Coakley. Every American, Republican or Democrat, should thank the people of Massachusetts for their choice of Senator. They should also thank Dorothy Rabinowitz, a Pulitzer Prize-winning journalist who, as early as 1999, exposed Martha Coakley for her role in the Amirault Case. The year was 1692. The place was Salem, Massachusetts. Two young girls began to blaspheme, go into trances and shake violently. The physician thought the girls were possessed, and when they awoke, the girls named those who had possessed them. The women were tried and hung. 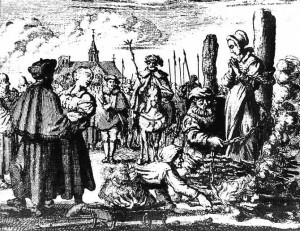 Other girls in the town mimicked the two girls and over a four month period, 19 women were hung as witches. The year was 1966. The place was Malden, Massachusetts. A woman and her two children were abandoned by the father. Rather than go on welfare, the mother opened a day care center known as Fells Acres. The woman was Violet Amirault, mother of Gerald and Cheryl. The school flourished for 18 years and enjoyed an excellent reputation, caring for thousands of children. The year was 1984. Violet was the principal of the school and Cheryl taught the toddlers while Gerald did most of the caretaking. One day, a young boy with behavioral problems wet his pants while napping. A teacher asked Gerald to change the child’s clothing. Gerald dried the boy and put him in dry clothes. The boy went home and told his mother that Gerald had taken the boy’s pants off and molested him. The mother called the police, who went to the school and arrested Gerald, closing the business down. The police then had the parents of the other children come to the police station where they were instructed to ask pointed questions of their children. Not one child mentioned sexual abuse or molestation. Enter pediatric nurse Susan Kelley and Middlesex County prosecutors. They intimidated the children. Nurse Kelley was particularly adept at suggestive questioning. The answers given were twisted by Kelley and the prosecutors. The Amiraults were accused of using a knife on one child, taking others into the “magic closet” for sordid purposes, trying a child to a tree, cutting the feet off a small animal, and so on. Hysteria once again would win the day. The Amiraults were tried and found guilty by a jury who found the slightest hint of child abuse to be detestable. Not one piece of evidence was ever produced at the trial. Gerald was sentenced to 30 – 40 years. Violet and Cheryl received 8 – 12 years. There were several appeals. Two Massachusetts Supreme Court judges – Robert Barton and Isaac Berenstein – on two separate occasions ordered the Amiraults freed. Both were overturned by the Supreme Court Judicial Committee, influenced by District Attorneys who had their eyes on becoming the Attorney General. Violet died of cancer in 1997. Cheryl was freed, but only under the harshest restrictions. She was never to speak about the trial. In 1999, Gerald was to be granted parole. The Attorney General for both Gerald and Cheryl’s cases was Martha Coakley. Gerald Amirault was freed from prison in 2004 after serving 20 years. In 2010, Martha Coakley lost her bid to be the next Senator from Massachusetts. We owe a debt of gratitude to the people of Massachusetts and to Dorothy Rabinowitz*, who fought so hard for justice in the Amirault Witch Hunt. *Articles by Dorothy Rabinowitz: The Wall Street Journal; August 24, 1999 and January 14, 2010.